Antioxidants are natural chemicals found both in your body and in the food you eat. Antioxidants act a bit like anti-rust by helping neutralise or disarm dangerous free radicals – highly reactive and unstable chemicals produced by your body as part of its normal metabolic processes. Infection, cigarette smoke, environmental pollutants such as smog and UV light, both from the sun and from artificial tanning studios, are also a source of free radicals. If not neutralised, free radicals go to war on your body, damaging all types of cells, including DNA. It’s thought that the actions of free radicals play a role in ageing and disease, including cancer. This is where antioxidants come in. They protect your body’s cells by ‘disarming’ free radicals and reducing their harmful actions. Modern environments are rich with sources of free radicals and so they can overwhelm your body’s natural antioxidant defences, especially if your diet is poor. A diet rich in fresh, minimally processed foods such as fresh fruit and vegetables, wholegrains, nuts and legumes means additional support. Enjoying a wide variety of fresh, whole foods is the best way to get the benefits of all the different antioxidants. As one of the richest fruit sources of antioxidants, an apple a day is a great start! 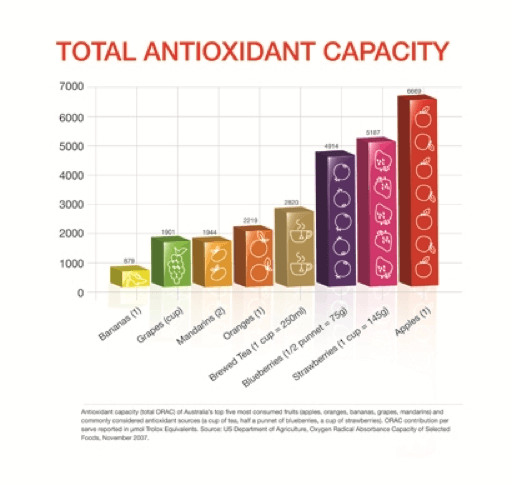 Antioxidant Claims… Beware the Hype! 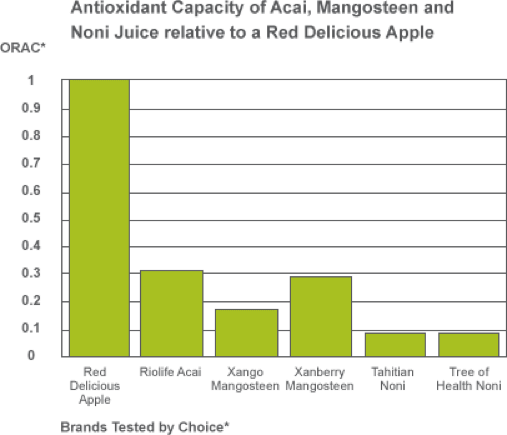 Choice tested the antioxidant activity of a range of “super” juices at a laboratory and compared the antioxidant content. There are lots of products that claim to be high in antioxidants – and some of these also claim to be able to reduce disease – but the reality is that some of the claims are just marketing hype. The so-called superfruit juices are a good example. Their claims were so extreme that Choice magazine conducted their own analysis to compare the antioxidant content of a serve of these juices to a red delicious apple. The results simply reinforce that eating apples is a much better and more affordable way to optimise antioxidant intake. 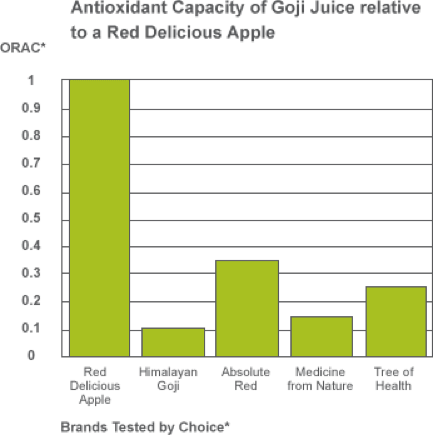 Choice tested the antioxidant activity of a range of these “super” juices at a laboratory and compared the antioxidant capacity of a “serve” of the juice (30ml) to a red delicious apple. Apples are a potent source of antioxidants with more than seven times the antioxidant capacity of bananas and more than twice that of an orange. Antioxidants are widely considered to be a measure of a food’s disease fighting potential and apples are a very rich source. more antioxidant power than a 1500mg megadose of vitamin C3. Antioxidant capacity (total ORAC) of Australia’s top five most consumed fruits (apples, oranges, bananas, grapes, mandarins) and commonly considered antioxidant sources (a cup of tea, half a punnet of blueberries, a cup of strawberries). ORAC contribution per serve reported in umol Trolox Equivalents. Source: US Department of Agiculture, Oxygen Radical Absorbance Capacity of Selected Foods, November 2007. The special mix of antioxidants found in every apple, boosts our body’s natural defenses by mopping up damaging free radicals. Left unchecked, free radicals can damage our body from the inside—even our DNA, the genetic material that sits at the very heart of every cell. Free radicals are produced naturally within the body as well as being derived from external sources such as cigarette smoking, environmental pollutants and ultraviolet light. By neutralising these damaging free radicals, the special combination of antioxidants found in each apple provides a vital boost to your body’s natural defenses. The combination of our environment and poor diet can overwhelm the body’s antioxidant defences leading to oxidative stress. Oxidative stress has been linked to a variety diseases including cancer, heart disease, Alzheimers, Parkinson’s disease as well as ageing. So we need to optimise our daily intake of antioxidants and apples are a great way to boost our antioxidant status.